As you’ll see in the attached video, my dog hates his own image. Or maybe he just hates small replications of his Biped. Either way, he has no access to money, so it’s not likely he was going to buy it anyway. 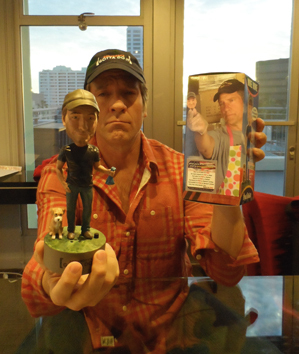 You, on the other hand, have an opportunity to pick up a truly unique Christmas present at genuinely obscene sum, and in the process, help us bolster the coffers here at mikeroweWORKS. If you’re not up to speed on my chronic attempts to raise money for Work Ethic Scholarships, our Great American Talking Bobblehead Initiative, (GATBI), has so far raised nearly $25,000. One hundred of these things have been hand-crafted in the USA, during a segment featured on last seasons show. All are being sold at auction from time to time, and today is the time for lucky number 7! Each one is numbered, signed by me, and possibly peed on by Freddy. 100% of the proceeds benefit the foundation. Bid here, if you’re so inclined.